Discover the Untersberg and get a shorttime of magnificent moments on the highest mountain next to the city of Salzburg. Salt used to be described as “White Gold” and it is true that the deposits created millions of years ago in the Dürrnberg, near Hallein have provided the region with its treasure chamber. More than 2500 years ago, the Celts were already mining this precious mountain resource, as is evident from the traces they left behind. 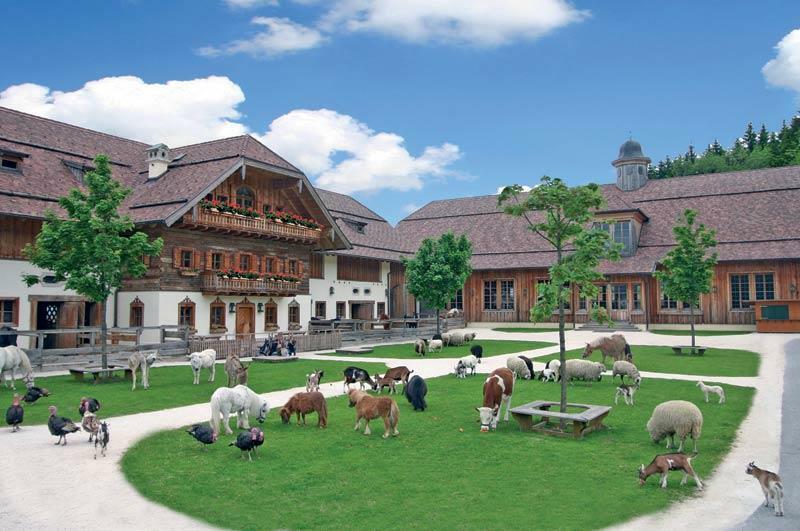 The Salzwelten offer fun and excitement for young and old all year round. The temperature in the mine is a constant 10° Celsius, therefore warm clothing and sturdy footwear are recommended in summer! For all those who must remain outside for safety reasons (children are only admitted to the mine from the age of four), there is still much to discover above ground: at the Celtic Village (right next to the Salzwelten) there is a fantastic playground, the Salzwelten Bistro offers nourishment and warmth, and time seems to fly by in the Salzwelten Shop. Hold tight: the pit railway takes you into the mine – and out again! Keep your eyes peeled: the tour through the fascinating salt mine lasts 75 minutes. 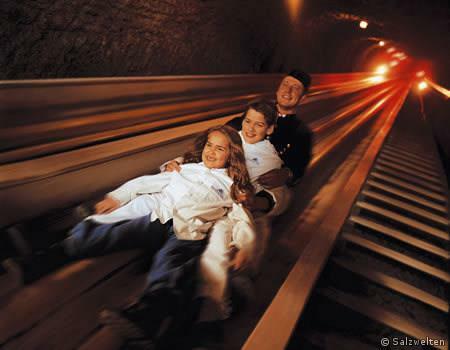 Rush along: speed measurement on two long miners’ slides! Ship ahoy: with a raft we float over the newly designed salt lake. The 900-year-old Hohenwerfen Fortress towers high above the Salzach Valley, between the Tennen and Hagen mountain ranges. 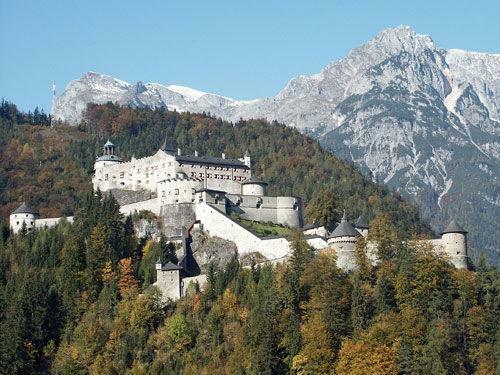 Adventurers and culture buffs will find exactly what they're looking for at Hohenwerfen: a variety of entertaining attractions including tours of the fortress, a weapons exhibit, a romantic castle tavern, a medieval shop and the historic Falconry Center with daily flight demonstrations, the first Austrian Falconry Museum as well as a birds of prey nature trail. The comprehensive calendar of events at Hohenwerfen Fortress is continuously updated and enhanced, e.g. the areas open to the public were adapted for guided night tours. Special programs are offered throughout the season, including countless afternoons offering folklore, theater performances, fairy tale walks, medieval activities, special tours, mystic nights and the special falconry programs. A lift is available to access the upper castle courtyard (optional). 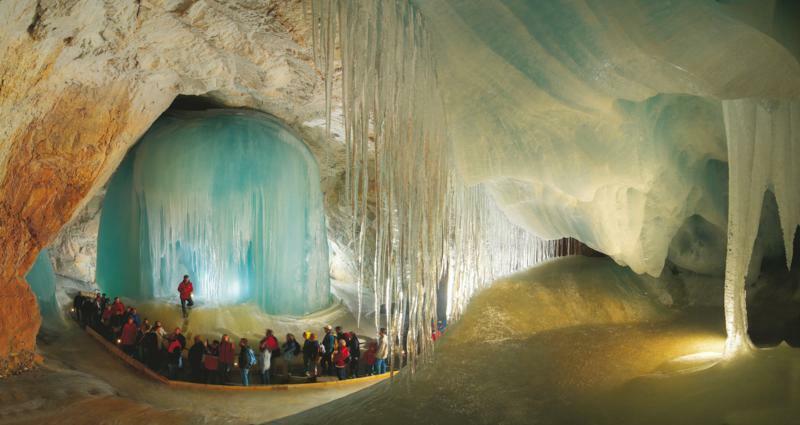 The world’s largest ice cave is located near Salzburg in the village of Werfen. Here you will find a fascinating display of ice and rock. To get to the mouth of the ice caves visitors take the steepest cable car in Austria and enjoy imposing views of the Hohen Tauern Alps and the Salzach valley. Those who venture into the world of the “Ice Giants” will find themselves in a totally foreign world – a labyrinth of nearly 42 kilometers of trails through the ice caves. The uniquely shaped corners carry such names as “The Empire of Diamonds”, “The Serpent” or the “Labyrinth of Demons”. Don’t worry, your trip through the ice caves will be led by an experienced guide! From the beginning of May until the end of October. Since 1960, the Eagle’s Nest has been under the administration of the Berchtesgaden – Königssee Tourist Office and has been leased out as a mountaintop restaurant. The imposing building with its massive foundation walls is typical of the architecture preferred during the National Socialist era. The ascent from the bus arrival zone into the building is most unexpected: a stone-lined tunnel leads 124 meters (406 ft) straight into the side of the mountain. At the end of the tunnel an elegant brass-lined elevator takes visitors on a 41-second ride another 124 meters (406 ft) up through the heart of the mountain and into the building itself. 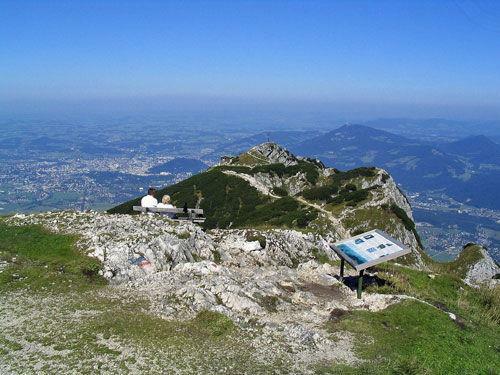 At the summit, visibility permitting, visitors can enjoy a breathtaking panoramic view over the Berchtesgadener Land. 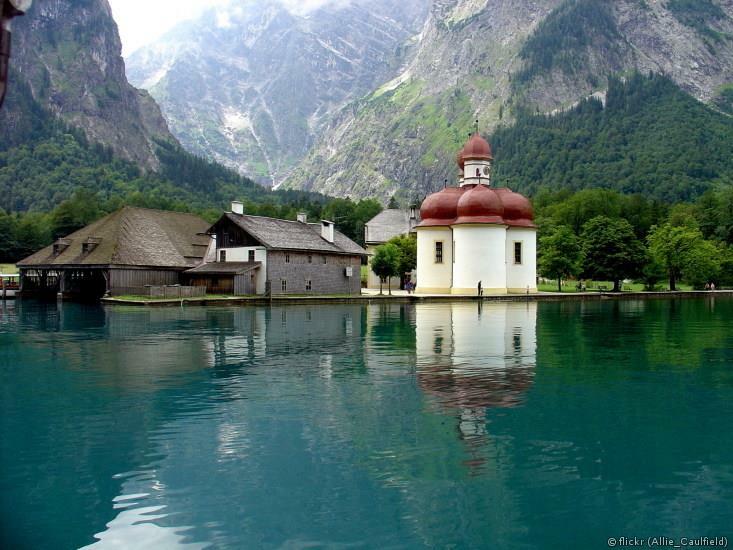 Lake Königssee, an aqua-green simmering jewel in the Berchtesgaden National Park, is surrounded by an impressive natural landscape. Rising 1800 meters above the lake is the gigantic Watzmann Mountain which serves as a backdrop for stunning boat rides to the chapel of St. Bartholomew. The lake, which reaches depths of up to nearly 190 meters, fills the entire valley. Located on an approximately 85 meter long peninsula is the pilgrimage church of St. Bartholomew with its 12th century chapel. A short 35 minute boat rides brings you to the church. This picturesque landscape has inspired many painters and visitors from across the world. 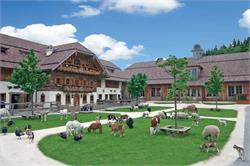 In this former hunting lodge of the Bavarian kings, guests can now enjoy regional culinary specialties. Here you can relax and enjoy, getting to know the surrounding area – at least until the ships’ whistle blows, calling you back to the harbor station of Schönau. The SchafbergBahn is the steepest cogwheel railway in Austria. 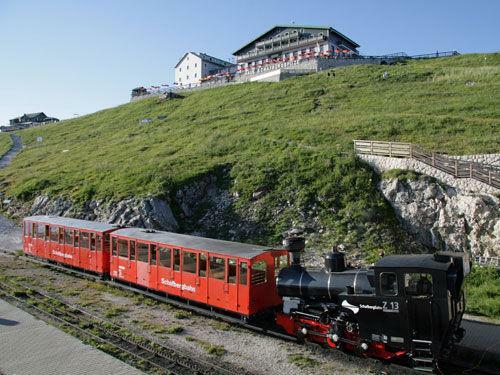 Since 1893 mighty steam locomitives have powered their way from the lake-side base station at Wolfgang to the 1783 m high summit of the Schafberg. The SchafbergBahn allows every visitor to conquer the mountain in comfort and style, making the entire journey an unforgettable experience! Trains are in service from the end of April through to October. 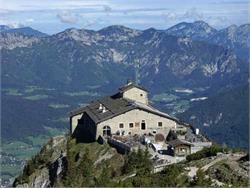 The trip to the top of the Schafberg starts at the lake-side base station in St. Wolfgang. After a few minutes, the track crosses the provincial border between Salzburg and Oberösterreich, before continuing its steep ascent through lush fields and green forests. At Dorneralm (1015m/3330ft above sea level) the first crossing point is reached. This is where the historic steam locomitives pause to take water. The next stop is the quaint station of Schafbergalpe at 1363 m (4472 ft). From there it takes another 10 minutes for the train to reach the summit. This segment is probably the most spectacular and already offers impressive views in multiple directions.